Orthodox worship is different! Some of these differences are apparent, if perplexing, from the first moment you walk in a church. Others become noticeable only over time. Here is some information that may help you feel more at home in Orthodox worship—twelve things I wish I'd known before my first visit to an Orthodox church. In an Orthodox church there is only one Eucharistic service (Divine Liturgy) per Sunday, and it is preceded by an hour-long service of Matins (or Orthros) and several short preparatory services before that. There is no break between these services—one begins as soon as the previous ends, and posted starting times are just educated guesses. Altogether, the priest will be at the altar on Sunday morning for over three hours, "standing in the flame," as one Orthodox priest put it. As a result of this state of continous flow, there is no point at which everyone is sitting quietly in a pew waiting for the entrance hymn to start, glancing at their watches approaching 9:30. Orthodox worshippers arrive at any point from the beginning of Matins through the early part of the Liturgy, a span of well over an hour. No matter when they arrive, something is sure to be already going on, so Orthodox don't let this hamper them from going through the private prayers appropriate to just entering a church. This is distracting to newcomers, and may even seem disrespectful, but soon you begin to recognize it as an expression of a faith that is not merely formal but very personal. Of course, there is still no good excuse for showing up after 9:30, but punctuality is unfortunately one of the few virtues many Orthodox lack. To say that we make the sign of the cross frequently would be an understatement. We sign ourselves whenever the Trinity is invoked, whenever we venerate the cross or an icon, and on many other occasions in the course of the Liturgy. But people aren't expected to do everything the same way. Some people cross themselves three times in a row, and some finish by sweeping their right hand to the floor. 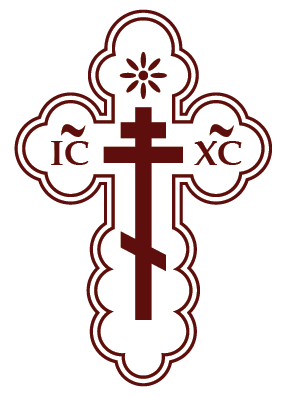 On first entering a church people may come up to an icon, make a "metania"—crossing themselves and bowing with right hand to the floor—twice, then kiss the icon, then make one more metania. This becomes familiar with time, but at first it can seem like secret-handshake stuff that you are sure to get wrong. Don't worry, you don't have to follow suit. Generally, we don't kneel. We do sometimes prostrate. This is not like prostration in the Roman Catholic tradition, lying out flat on the floor. To make a prostration we kneel, place our hands on the floor and touch our foreheads down between our hands. It's just like those photos of middle-eastern worship, which look to Westerners like a sea of behinds. At first prostration feels embarrassing, but no one else is embarrassed, so after a while it feels OK. Ladies will learn that full skirts are best for prostrations, as flat shoes are best for standing. This leads to the general topic of fasting. When newcomers learn of the Orthodox practice, their usual reaction is, "You must be kidding." We fast from meat, fish, dairy products, wine and olive oil nearly every Wednesday and Friday, and during four other periods during the year, the longest being Great Lent before Pascha (Easter). Altogether this adds up to nearly half the year. Here, as elsewhere, expect great variation. With the counsel of their priest, people decide to what extent they can keep these fasts, both physically and spiritually—attempting too much rigor too soon breeds frustration and defeat. Nobody's fast is anyone else's business. As St. John Chrysostom says in his beloved Paschal sermon, everyone is welcomed to the feast whether they fasted or not: "You sober and you heedless, honor the day...Rejoice today, both you who have fasted and you who have disregarded the fast." Every Orthodox church will have an iconostasis before its altar. "Iconostasis" means "icon-stand", and it can be as simple as a large image of Christ on the right and a corresponding image of the Virgin and Child on the left. In a more established church, the iconostasis may be a literal wall, adorned with icons. Some versions shield the altar from view, except when the central doors stand open. The openings on the other sides of the icons, if there is a complete iconostasis, have doors with icons of angels; they are termed the "Deacon's Doors." Altar boys and others with business behind the altar use these, although no one is to go through any of the doors without an appropriate reason. Altar service—priests, deacons, altar boys—is restricted to males. Females are invited to participate in every other area of church life. Their contribution has been honored equally with men's since the days of the martyrs; you can't look at an Orthodox altar without seeing Mary and other holy women. In most Orthodox churches, women do everything else men do: lead congregational singing, paint icons, teach classes, read the epistle, and serve on the parish council. Why then the multiplicity of ethnic churches? These national designations obviously represent geographic realities. Since North America is also a geographic unity, one day we will likewise have a unified national church—an American Orthodox Church. This was the original plan, but due to a number of complicated historical factors, it didn't happen that way. Instead, each ethnic group of Orthodox immigrating to this country developed its own church structure. This multiplication of Orthodox jurisdictions is a temporary aberration and much prayer and planning is going into breaking through those unnecessary walls.